Anderson Silva has been one of the key faces of UFC in the organization's history. His dominating presence in the ring as well as his global marketability have made Andreson Silva cards and autographed memorabilia key collectibles for MMA fans. The multi-disciplined Brazilian, nicknamed "The Spider," is a master in Muay Thai and is a black belt in Brazilian Jiu-Jitsu. 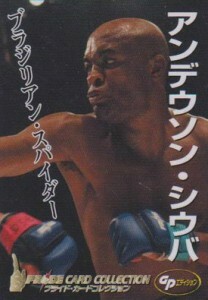 The earliest known trading cards of Anderson Silva come from the period of time when he was fighting with PRIDE, a MMA organization based in Japan. He has two cards in their 2006 set, a base card and a foil insert. They are considered extremely rare and sell in the $100 range which is pretty amazing for a standard base and insert card. Silva's mainstream hobby debut came three years later when he was included on the checklists of both 2009 Upper Deck Goodwin Champions and 2009 Topps UFC Round 1. 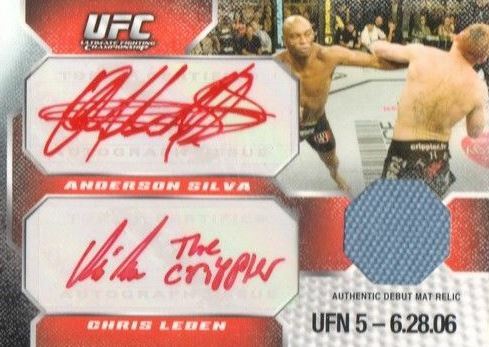 Anderson Silva's autographed trading card from the Topps set is treated as a rookie autograph by collectors and often sells for several hundred dollars. It occasionally hits four figures. 2009 Upper Deck Prominent Cuts also has an Anderson Silva autograph in its Cage Fighters insert set, but these do not carry anywhere near the same value as his Topps UFC Round 1 cards. In addition, Round 1 also contains Silva's first memorabilia card. As a premier fighter and face of the UFC, Silva's signature is always in demand. The organization is top-notch in the marketing of its fighters and facilitates numerous in-person signing events. As a result, Silva's memorabilia is plentiful but, at the same time, has not flooded the market. This allows his signature to maintain its value. 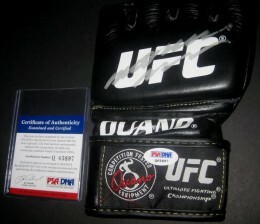 Promotional fight posters, gloves, and pictures are some of the most frequently signed items. Promotional posters from key title defenses signed by both opponents often carry a premium. An extremely tough card to find, this is the Holy Grail of Anderson Silva cards that don't include an autograph. Released in Japan, not many have made their way to North America. This card features Silva in a PRIDE fight from 2004. Like the base card, this one is very difficult to find due to its Japanese distribution. While no specific print run is known, it is believed that around 200 copies of this card exist. On the rare circumstance that one finds its way to the secondary market, they sell in the $250-$350 range. A red ink version serial numbered to 25 copies sells in the $1,500 range. This is one of two 2009 Topps UFC Round 1 dual autograph relic cards to feature Silva. The other card pairs Silva with Lyoto Machida. Both are limited to 25 copies. Below you will find examples of what an authentic Anderson Silva signature autograph looks like. This can be used as a first point of reference for determining the legitimacy of autograph memorabilia, but is not a substitute for having your items authenticated by a well-respected professional autograph authentication company. Some of the trusted sources within the sports memorabilia market include the following companies: PSA, JSA, Tristar, UFC and Mounted Memories. Click on any of the images below to view full size photos. A truly dreadful signature that consists of a couple of scribbled lines. The pen pauses in three distinct spots, in the first character "A," the middle and the end. The top line is supposedly "Anderson" and the bottom line an "S" for Silva. Anderson Silva Authentic Signed 11x14 Photo PSA DNA COA UFC "THE SPIDER"